For additional information please feel free to contact us directly by phone or email to talk to an expert about your specific requirements. Triptych Construction LLC crews specialize in rock / slope stabilization and rock fall mitigation work to rock faces, and soil slopes. With more than 30 years combined experience, our management team is able to provide expert advice and committed to delivering innovative and cost effective solutions. We have trained scaling professionals who know how to take down loose rock safely and efficiently. Typically, rockfall events are mitigated in one of two ways: either by passive mitigation or active mitigation. Passive mitigation is where only the effects of the rockfall event are mitigated and are generally employed in the deposition or run-out zones, such as through the use of drape nets, rockfall catchment fences, diversion dams, etc. The rockfall still takes place but an attempt is made to control the outcome. In contrast, active mitigation is carried out in the initiation zone and prevents the rockfall event from ever occurring. Some examples of these measures are wire rope lashing, rock bolting, slope retention systems, shotcrete (sprayed concrete), etc. Frequently a combination of techniques is used. We use various scaling methods such as hand scaling starting from the top of the rock slope and working our way down bringing any loose material down as we go. We also use air bags to put behind bigger rocks and use air pressure to push rocks down. Cable method consists of hooking a cable to loose rock and heavy equipment and pulling rock off bank. We often hang double twist wire mesh to cover rock slopes. Our crew members have hung several million sq. 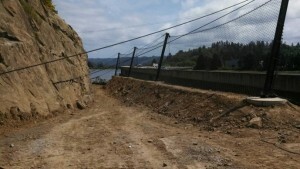 ft. of mesh in Oregon, Idaho, and Washington, in addition to the use of various other wire and cable netting systems.